BlogHome » News » Win a Luxury Dining Room Featuring a Live Edge Table from Rembrandt Homes! Win a Luxury Dining Room Featuring a Live Edge Table from Rembrandt Homes! Who doesn’t love the chance to win an AMAZING prize? 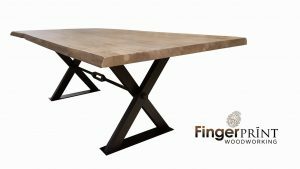 Live Edge Sophia table by FingerPRINT woodworking – from Austin & Taylor. Visit them in the lobby for your chance to win this amazing prize!